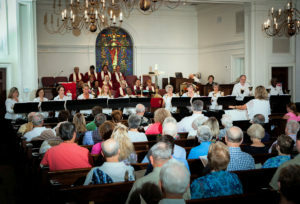 Bluffton United Methodist Church uses music to generate excitement, beauty and inspiration during worship services. The choral and instrumental programs are intended to nurture those involved and to give a means of contributing in worship, outreach and praise as well as an opportunity for personal growth and enjoyment. 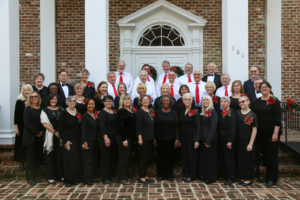 Our Music Ministry welcomes anyone who would like to join in this most rewarding endeavor. Whether you are a professional musician or someone who wishes to join a musical group for the first time, there is a place for you. Our Music Ministry offers a variety of ensembles and musical styles for any musical taste and experience level. For more information about participating in the Music Ministry, please contact Ella W. Davis, Director of Music at 843-379-5241 or ewdavis21@gmail.com. 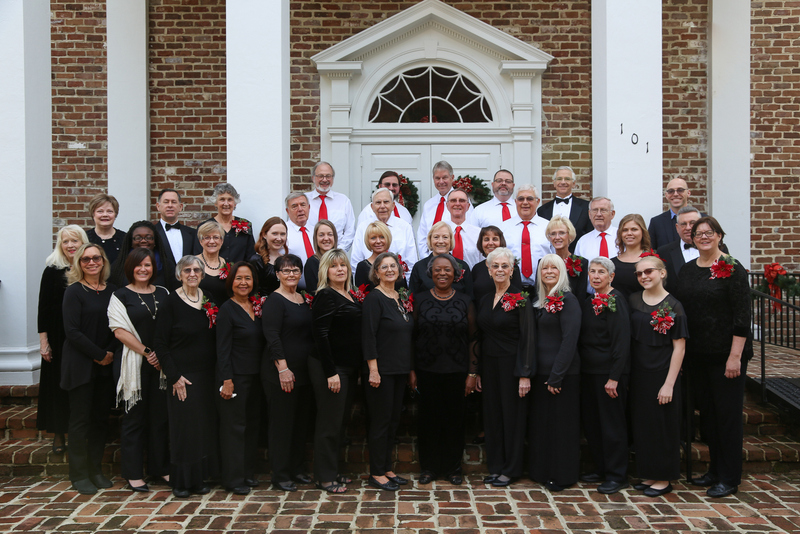 Chancel Choir provides worship leadership each Sunday at the 11am service. This ensemble consists of adults with various ability levels. Rehearsals take place Wednesday evening from 7:00-8:30pm in the Music Suite. In order to assure your proper vocal section assignment, a simple private vocal assessment is requested. 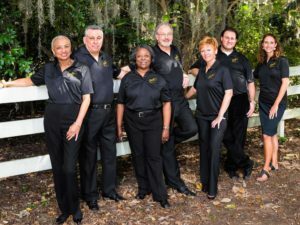 Praise Team is a versatile group of youth and adult vocalists and instrumentalists with music reading or chart reading skills who are passionate about worship. Praise Team provides worship leadership bi-monthly or as needed. Rehearsals are held bi-monthly on Saturday 10:00 to 11:30 AM in the Sanctuary. The Wesley Ringers is a handbell ensemble for youth and adults with music reading skills or the desire to learn. This ensemble rehearses Monday evenings from 7:00-8:30pm. To participate in the handbell program or for more information contact Karen Wyld, Director at 843-707-7454 or kwyldk@gmail.com . Cherub Choir is designed for all children age 4 to 9. 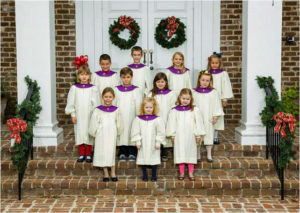 Cherub Choir provides worship leadership several times during the liturgical year. Cherub Choir rehearses Wednesday evenings from 6:00-6:45 pm in the Music Suite. To participate in Cherub Choir or for more information contact Ella W. Davis, Director at 843-379-5241 or ewdavis21@gmail.com. Ella Wilson Davis was born and raised in Pittsburgh, PA. She attended the Oberlin Conservatory of Music, Oberlin(OH) and during her junior year studied at the Mozarteum in Salzburg, Austria. Ella graduated with a BM degree in vocal performance. Following graduation she was awarded a German grant to study voice for a year at the Hochschule für Musik in Munich, Germany. Upon her return from Germany, Ella earned a MM degree in vocal performance from Duquesne University, Pittsburgh, PA. Ella was the director of The Cleveland Orchestra Children’s Chorus for nine years. After teaching public school vocal music for over 30 years, she retired and became the Director of Performing Arts at The Cleveland Music School Settlement, Cleveland(OH) and later Interim Executive Director. In 2001 she and her husband, Milton moved from Cleveland to Bluffton(SC). 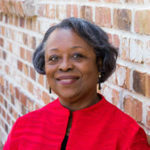 Since 2004 Ella has served as Director of Music at Bluffton United Methodist Church. Her responsibilities include directing Chancel Choir, Cherub Choir, and Praise Team as well as coordinating the Wesley Ringers. Greg Hollinger has served as organist in various churches for 49 years in Ohio and in the Low Country. He studied the organ privately with W. Robert Morrison of Canton Ohio, Dr. John Ferguson of Kent Ohio and Robert Quade of Akron Ohio. 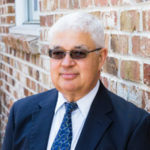 He has been a member of the American Guild of Organists since 1967, having served in various leadership positions in the Canton, Ohio Chapter and in the Low Country Chapter. A Registered Professional Engineer, Greg resides in Bluffton with his wife Pamela. He has two daughters and three grandsons.